“Let’s get you a new rug.” I’d say, nodding toward the 8×10 baby blue Pottery Barn square lined with fire trucks that warmed his floor. “And maybe a new lamp?” I’d add hopefully, pointing at the matching old one by his bed. Each time it was suggested, he’d scrunch up his face and shake his head adamantly, like a toddler who had just been offered broccoli. “Come on,” I’d coo. “I’ll get you cooler new ones. You know you’re eight.” Then nine. Then ten. Now eleven. “No. I like my stuff.” Was all he’d say on the matter, year after year. I never even considered mentioning the piles of stuffed animals that adorned his bed. They were untouchable. Besides, I was really in no hurry for him to grow up either. Still, when the ‘baby’ stuff in his room outweighed the ‘kid’ stuff, I worried about the random friend of his who might come over and comment. Many are second or third born boys graced with a social maturity that my first born just doesn’t have. But while I prize his innocence, I certainly didn’t want him being singled out by a snarky 10 year-old. My son’s attachment to his youth wasn’t just about his stuff. Easily, from his third birthday on, he would mourn the loss of the passing year. To never be three or four or five… Growing up was painful for him. He resisted hard, wanting to remain a baby forever. I hurt physically watching him struggle, completely understanding his pain; wanting him to stay little and nestled in my arms and afraid of his growing up and away. I got it, probably more than he did. But I also knew it was my job to help dissipate that fear, so while I continued nuzzling, I whispered warm tales of the fabulousness he would enjoy at each growing age to his covered up ears. We continued that way for years, holding on to each other, working up the strength to let go. When he turned 11 and entered middle school, he naturally just took a step forward and I watched holding my breath. The boy who barely crossed the street on his own was now walking home with friends. And on Fridays, they all wandered en masse down our town’s main street invading local pizza and ice cream stores. It was an explosion of freedom, baby strides not steps, and my boy happily hopped to it. My husband and I looked at each other momentarily startled, and it took us a beat before we burst into action. Immediately, my husband started clearing the rug of all the toys and crap, literally and figuratively, and rolled it up. Instantly, hoards of papers, trinkets and little toys that he had been compiling for years suddenly found itself in two separate bags – one to be tossed and one to go down into the basement. My husband and my son worked hard and efficiently, but instead of being enthusiastic, I grew more and more melancholy. Still, I couldn’t and wouldn’t stop this locomotive. It was good, I told myself. Sudden, but good. Ultimately we left his two favorite stuffed animals on his bed, bagged the rest and placed them in his closet. 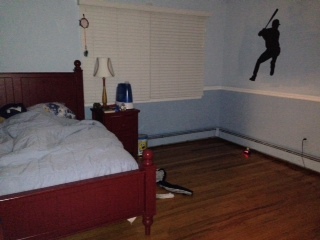 By 10pm, we were done and my son had an entirely new feeling room. One without the toddler rug and lamp. One without dinosaurs, matchbox cars and piles of drawings and games he spent endless nights creating. One with very little baby left in it. Except of course mine. The baby who was now pushing 12. For years he refused, but now it seems he’s ready to grow up a little. It’s a really good thing, which I’m sure I’ll realize once I stop crying. Posted in Boys! and tagged growing up, middle school, parenting, pre-teens, transitions. Bookmark the permalink. Crying! This was really well done, honey! My heart hurts. Oh my goodness! It is so painful and reassuring when they realize they are growing up. There are key times I remember as my son was getting older that things like this happened. Now he’s 33 and a man. This was a beautiful post!! thank you. it’s so hard letting go of the little boy. i hope he’ll still give good hugs at 33. This one really got to me Alisa! I felt like this when we painted over the clouds and took down the airplane border in the boys room. And I felt like this again when my 9 year old switched his comforter from a Toy Story one to a plain blue one a few weeks ago. I will really lose it when all the stuffed animals go! It’s wonderful and amazing to see them grow up and change, but at the same time it really breaks my heart too. Nice to know I’m not alone! xo Beautiful piece my friend! thank you. it’s so hard watching them grow up. i would have lost it painting over the clouds. and he was soooo attached to those animals.. it was painful watching them get shoved in a bag. so bittersweet..
That’s a sweet story. So hard to see them grow up even when we work so to help them become independent. Thanks. Growing up is hard! Alisa, that was a wonderful tribute to your son. thank you. it’s all so bittersweet this growing up business. It is. Our daughter just turned seven in March. Luckily, she still loves to cuddle. I know it will be diminished as she matures but I hope she saves her mom just a few cuddles. that is a really smart idea!! It’s tough letting our babies go. My son is the same age, so this is quite poignant for me, too. it was tough to take. you don’t realize it until you’re in it. That’s a transition I’d never considered…. oh crap i’m crying now too. I know they have to grow up and mature and all that jazz but man, why does it have to hurt so much at times? hugs to you. Awwww. we haven’t reached that stage yet but I think it wont be long. I will cry a river, I think. Hugs to you mama! thanks. transitions are so hard! Sometimes I think even if they were 18, we’d still have a problem with some things. 😉 My son has done all of that room stuff slowly. Funny though, it was when he painted his room a different color that I got sad. Too big boy I guess. And the other big thing was when he decided he was too old to be read to at night. My heart. yes. a mother’s heart is so fragile. Now I’m about to cry! Who knew that being a parent was so incredibly heartbreaking? Beautiful essay…..
so true… and thank you. I know it’s the result you wanted, but it makes me tear up. He seems like such a wonderful, tender-hearted little guy. oxoxo and Happy Birthday!!!! i was all in and then i was totally not in. but i shut that away and instead hid in the closet clutching wine and his stuffed animals crying. 😉 and thank you. As a child, I had a hard time letting go and moving on from my childhood things. I wonder if my parents felt the same way. if they’re like me, they did. as a kid i never really considered my parents perspective on anything. I hope that he reads this one day. This is such a lovely and wonderful tribute to your special little guy. Oh man. Heart . . . strings . . . pulled! My almost 9 year old is the oldest of 2 boys and has the same issue. He is still very much a baby at heart and had a million stuffed animals on his bed. While he loves sports and many “grown up” things, he still clings to that youthful kid existence. I might die when he finally gives up his animals. Truly. He’ll always be my baby. i know!! so hard!! but true, they’ll always be our babies. no matter how old. just like that creepy book, love you forever. My heart ached as I read this. You see, we just listed our house. The one where my healthy dad planted 16 gorgeous peony trees. The one where my son was 16 months old and is now 21. My heart is aching. ohh so difficult. life is so beautiful and bittersweet. and yes, must always look ahead but those first steps forward are always the most difficult. You tugged at my heartstrings with this one 😦 Why do they grow up? Mine is 7 going on 8 and I feel a catch in my chest every time she says something mature. Change is good though and I know you’ll sail through just fine. This is MY son. Everything. I could’ve wrote this word for word. And he’s even the same exact age. Only difference: we are starting middle school this fall and so we haven’t had our clean up day yet. Stuffed animals line the entire bed. But he’s my sensitive one. my hugging one. I’ll stop now before I get teary. Yes! I read that one first! Awesome post. When you say “transition” in what way (s) do you mean? Everyone keeps using this word, but I want it better defined!! Physically, socially, study habits?, work ethic, attitude? Ah! I’m so nervous be cause he already has a horrendous attitude (apathetic)! Which drives both my husband and I crazy. (along w the smart mouth as well)! Ok, I get it……. But I’m not happy at ALL to hear about the school work. That’s gonna kill us. Right now , our 30 min/1 hour of homework everyday is absolutely miserable. It’s something I all most have to drink to get through ! He’s not interested in learning about much of anything. Although he’s very social and loves thinking/ playing on his own. Ok, we need a game plan next year for home work. Thanks a lot ! ha! yeah, i know. but once you get a routine and you both get used to it, it’ll be alright. don’t think about it now!! haha! you’ve got a summer to enjoy!